I love to snack! Snacking doesn’t typically go hand in hand with healthy eating. I try my best to keep lots of fruit and veggies in the house so when I’m feeling peckish in the evenings I have something healthy to grab but sometimes I just want something salty and crunchy. These kale chips hit the spot while still remaining quilt free. They are easy to make and can be stored in an air tight bag for a couple of days (though they probably won’t stick around for that long). Give this recipe a try the next time you want to have a clean snack. 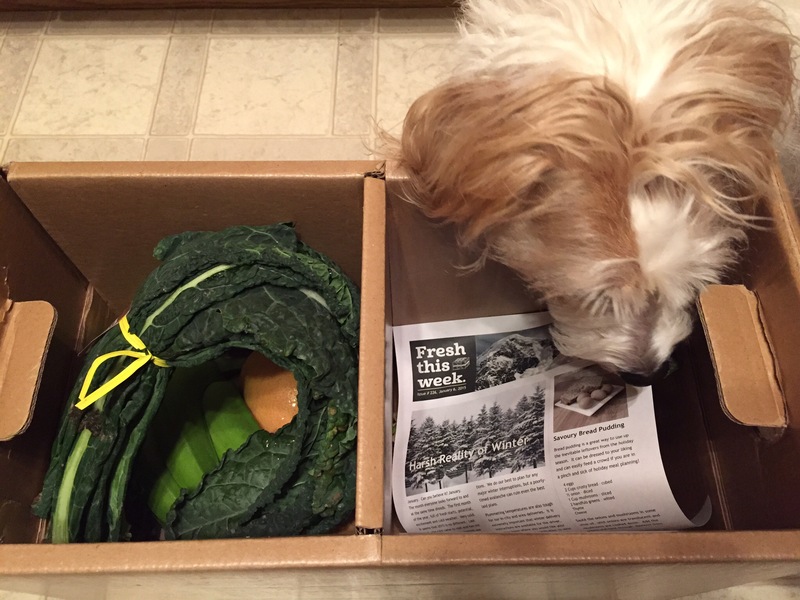 – Remove the middle rib from each kale leaf. Then cut into “chip” sized pieces (about 2″ square). – Use a salad spinner to rinse and dry your kale. – Place kale in a single layer on 2 baking sheets. Spray lightly with olive oil. – Place in oven for 8 minutes. Remove from oven and carefully turn the kale chips over. Careful because the pan is hot! Sprinkle 1T of Parmesan on each tray doing your best to get the cheese actually on the kale. (I do this slowly and pretty close to the kale so it doesn’t just jump off). Put trays back in oven for 2 mins. Remove from oven and allow to cool on tray before transferring to a bowl to serve. Be gentle when transferring as they are quite fragile little chips. This version of chicken parmesan is healthier than most as it is baked not fried and served on a bed of spaghetti squash instead of pasta. I made it a few weeks ago and it was really quite easy to make. Plus both hubby and I gobbled it right up so it was tasty too. – Cut the spaghetti squash in half lengthwise and rub with olive oil, then sprinkle with salt and pepper. Place cut side up on a baking tray and bake at 350F for 40 minutes then turn over and bake for another 20 minutes. The squash is fully cooked when it’s tender when you stick a fork in it (like a potato 😉 ). – For the chicken mix the coating ingredients together in one bowl and wisk the egg wash ingredients together in another bowl. – Take each chicken breast and coat first in egg wash then in the coating. Make sure to really press the coating onto the chicken. Then place the chicken on a baking sheet. Bake at 350F for 25 minutes or until cooked through. – While chicken is cooking chop basil. An easy way to chip basil is to stack all of the leafs then roll them all up tight and slice. You get nice long ribbons like this. – Once chicken is cooked remove from oven and spoon about 3 tablespoons of marinara on the top of each piece of chicken then sprinkle 1/4 cup of mozzarella on top. Then sprinkle top with basil. Return chicken to oven for about 5 minutes until the cheese is melted. – Heat the remaining marinara sauce to use on the squash. – Once the squash is cooked give it about 5 minutes to cool then use a fork to scrape the strands loose. Season to taste with a little more salt and pepper and mix in 2 table spoons of the basil. – To plate put the squash on plate first then top with marinara then a chicken breast. It’s been way too long since my last post. We moved and it’s been hectic! So far I have not had time to really test my new kitchen and see what the pair of us (kitchen and I) can get ourselves up to. But in the meantime I am happy to bring you a review of a little sandwich deli in my new neighbourhood. ﻿I’ve been going to Careit Urban Deli for a few years now. When I used to work on the west end it was close enough that we could go grab a sandwich during the lunch break. Since Careit is so close to my new home and we’ve been so busy with unpacking, painting, organizing and such I’ve managed to eat there a handful of times in the last few weeks. They strive for “as natural as possible without the extra cost“. 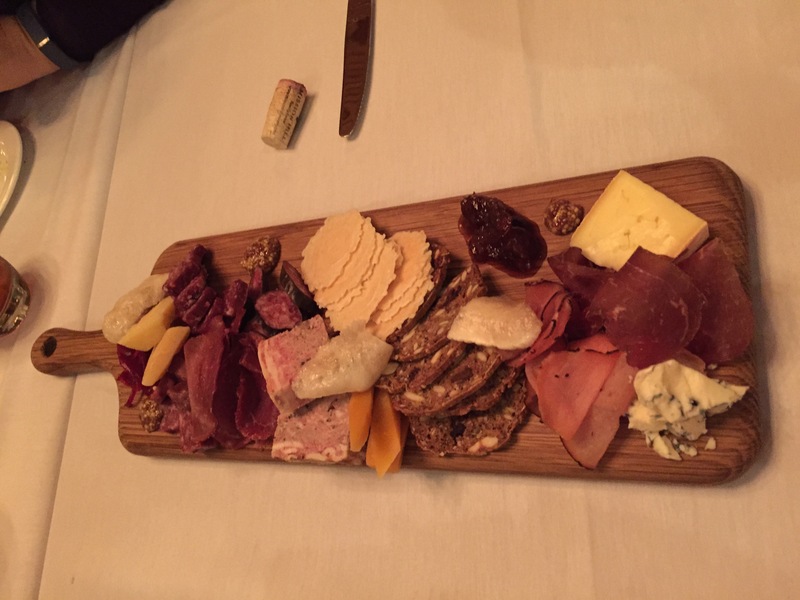 All of the meats for their sandwiches are from local farms and are cooked in house. They now have a few locations in the city; Hamptons, Crestwood, St Albert and if I heard correctly one opening some time this year (2015) downtown. ﻿﻿As well they make fresh made soups daily. I’ve had a few of those too; mulligatawny, beef borscht, chicken noodle, broccoli cheese, Italian Turkey. All have been really good. And they sell ready to go meals, fresh meat and farm eggs. The beef stroganoff is really good and I just picked up the Singapore noodles to try for supper tonight. On Sunday’s they have brunch as well. What doesn’t this amazing little deli do? As I’m sure you all know by now I love supporting small local businesses and the fact that Careit Urban Deli also supports local by purchasing fresh meats and veggies from area farmers makes them top notch in my books! 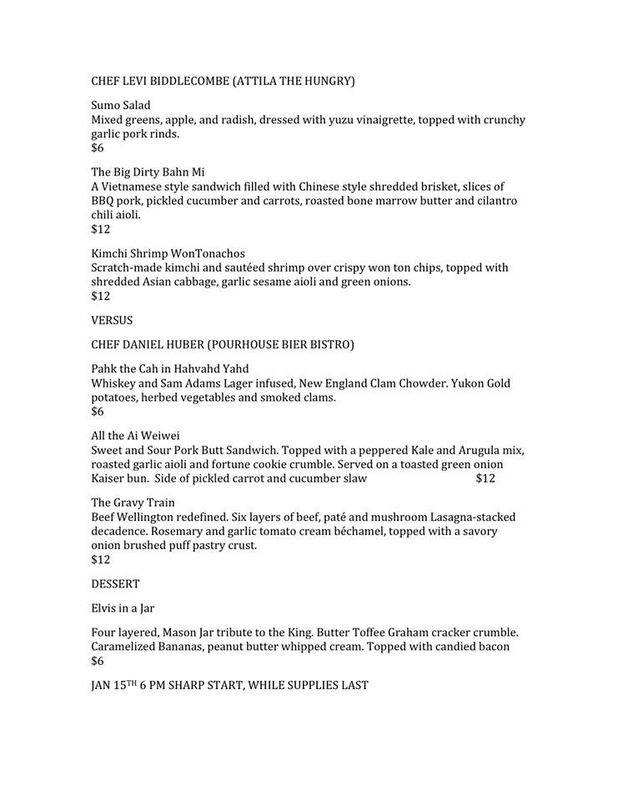 So last Thursday I went to the Pourhouse Bier Bistro for a Popup event. It was a chef VS chef showdown! The Burly Chef (@theBurlyChef) of the Pourhouse VS Chef Levi (@LeviB57) of the Attila the HUNgry food truck. Seems these 2 chefs have a friendly rivalry going on and we are the benefactors! The event started at 6pm sharp! I made sure to book a reservation just to be sure I would get a spot. Far as I could tell the winner was to be determined by who had the most dishes ordered from their menu. I ordered from Chef Levi’s menu which was Asian fusion inspired. 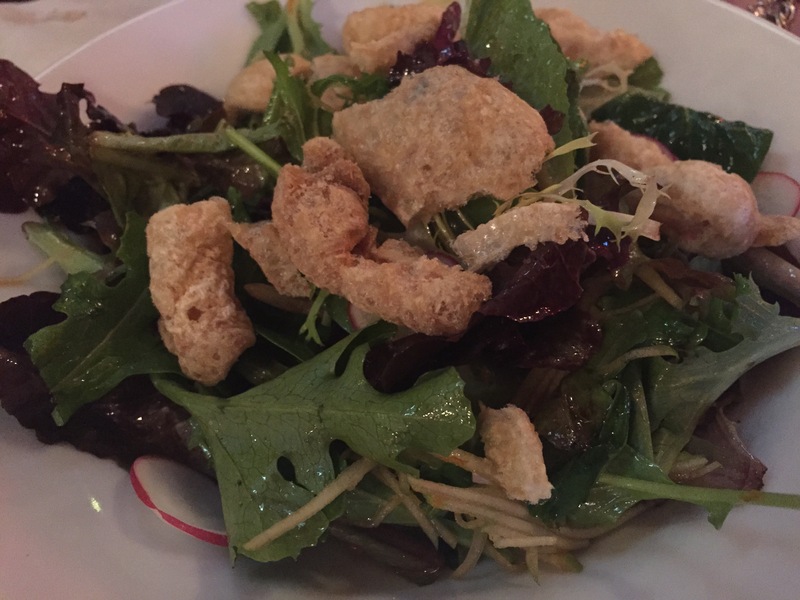 I had the Sumo Salad which was mixed greens with matchstick apple and thinly sliced radishes topped with a yuzu vinaigrette dressing and crunchy pork rinds. The dressing was nice and zippy while still being balanced and the apples added a good sweetness while the pork rinds were a good crunch. My main was the Big Dirty Bahn Mi. 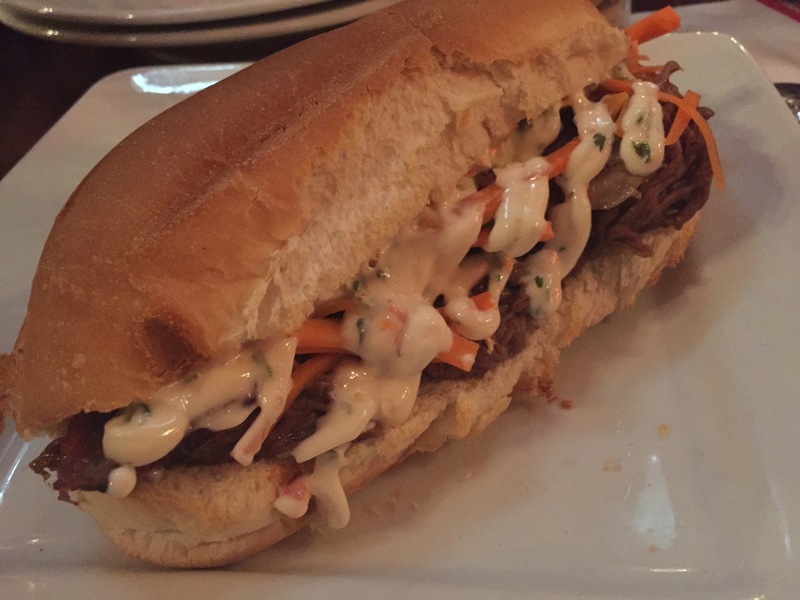 Which was a Vietnamese style sandwich with Chinese style shredded brisket, slices of bbq pork, pickled cucumbers and carrots, roasted bone marrow butter and a cilantro chili aioli. Wow! This sandwich was AMAZING! I am an avid sandwich lover and this hit the mark. The brisket was so moist it saturated the bun but not to the point of it being soggy, the carrots added a good crunch and flavour from the pickling and the aioli was outstanding! The friends that I went with are always very generous in sharing their food for the sake of research so I also got to sample 2 other dishes. 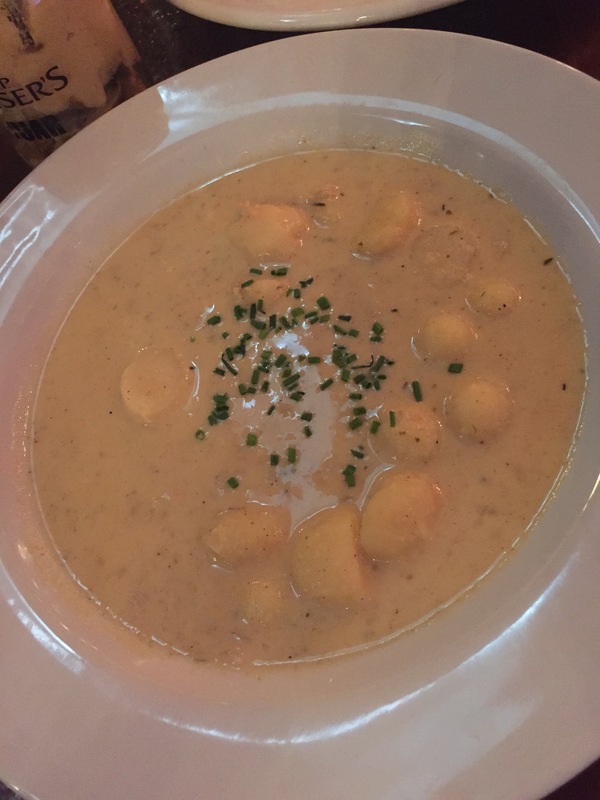 The ‘Pahk the Cah in Hahvahd Yahd’ from the Burly Chef’s menu which was a New England clam chowder that featured Yukon gold potatoes, smoked clams and was infused with whiskey and Sam Adams lager. Very tasty as well, the flavours were all well rounded and complemented each other nicely. The other dish I tasted was the Kimchi Shrimp WonTonachos from Chef Levi. 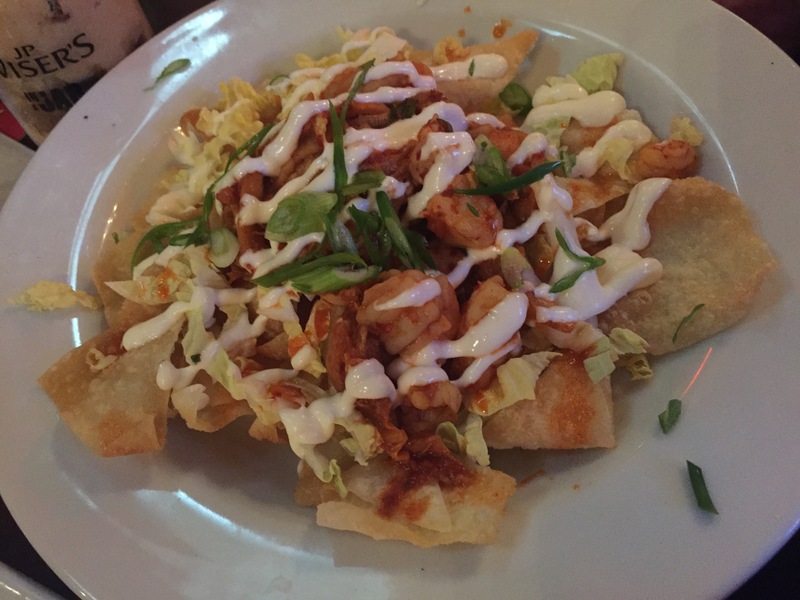 This dish had ‘puffy’ crispy wonton chips topped with made from scratch kimchi, sautéed shrimp, shredded Asian cabbage, green onions and a garlic sesame aioli! Holy Hanna this was outstanding! I wish I had more room in my belly so I could stuff more food in my face hole! The kimchi wasn’t too spicy and the aioli calmed the bit of heat, the shrimp were perfectly cooked! I seriously considered asking if I could get a plate of these to go but decided against it since they would probably get soggy. 2 other items were ordered at our table that I was unable to try due to allergies and they both looked good as well. 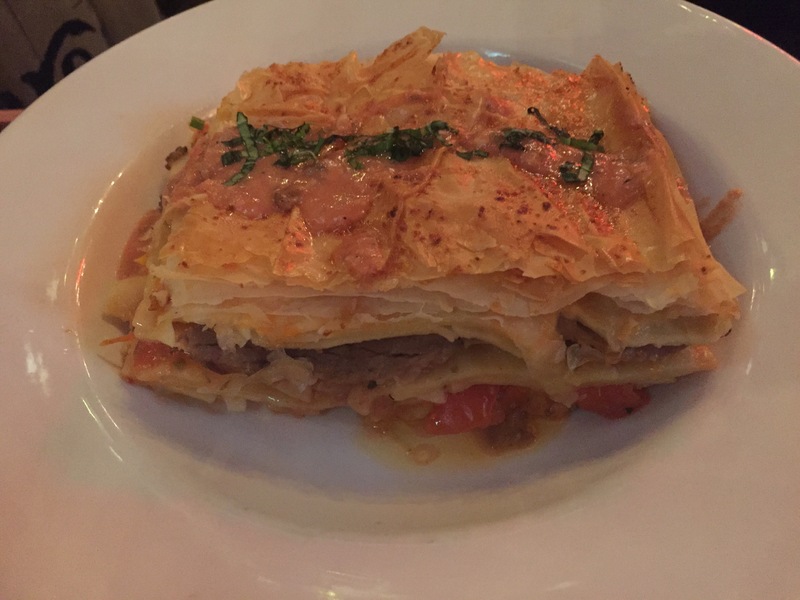 The Gravy Train – an undone lasagna style beef Wellington and the Elvis in a Jar – banana, peanut butter whipped layered dessert. Which both got a lot of yummy noises from around the table. I found out later that night via Twitter that the Burly Chef was the champ of the night! And Chef Levi signed up for 2 more of these popups (so follow these chefs on Twitter for more details). Continuing with our weekend trip to Calgary before Christmas we also had the chance to get a quick bite at Without Papers. 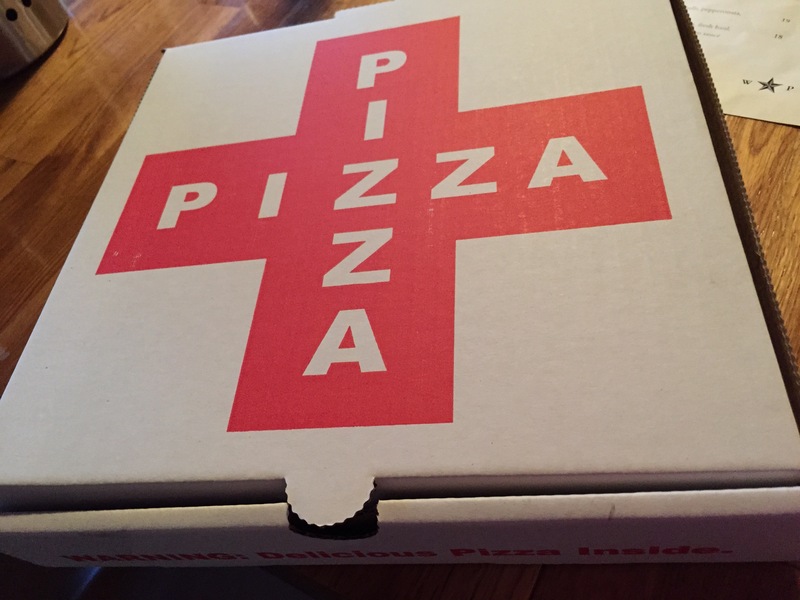 I saw this restaurant on a food show at some point and I guess the name is a mock towards some Neapolitan Pizza Association that permits ‘certification’ through training for ‘authentic’ Neapolitan style pizza and the fact that they are ‘without papers’. This pizza joint isn’t very big and is a climb up some narrow stairs but once inside its a pretty cute little spot. With an open kitchen and a movie projected on the wall (with subtitles) it’s a neat place. Each of the four of us ordered a separate pizza and shared. Ward’s pick (not surprising) – Hawaiian 5-0: tomato sauce, Canadian back bacon, pineapple, jalapeño, aged cheddar, mozzarella ($19). The jalapeños weren’t overly hot for the pizza but added a nice touch. I chose the Hog Wild: roasted garlic panna (garlic & cream sauce), wild boar sausage, salami, rapini (broccoli rabe), fontina, chili oil ($22). Again I was a little concerned that the chili oil would add too much heat but it was just right. Hutch: tomato sauce, calabrese salami, genoa salami, pepperonata, mozzarella ($21). This pizza was spicy! Pizza the Hut: tomato sauce, wild boar pepperoni, mushrooms, mozzarella, fontina ($19). A good combination of items. 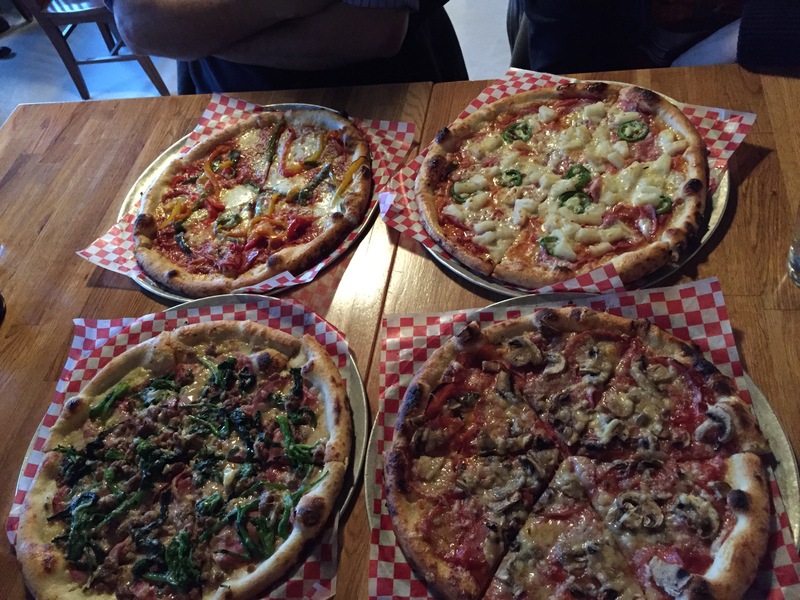 All of the pizzas were really good! I love the thin crust of the Neapolitan style pizzas. No complaints here on anything. We had a couple pieces left that they boxed up for us and were tasty cold later. I would happily go and try more of their creations. So a few weeks before Christmas we made a road trip to Calgary for the weekend to surprise our friend Mike for his birthday. To surprise him we met him and his wife, Amber, and another couple friends of theirs, Doug and Star, for dinner at The Selkirk Grille. 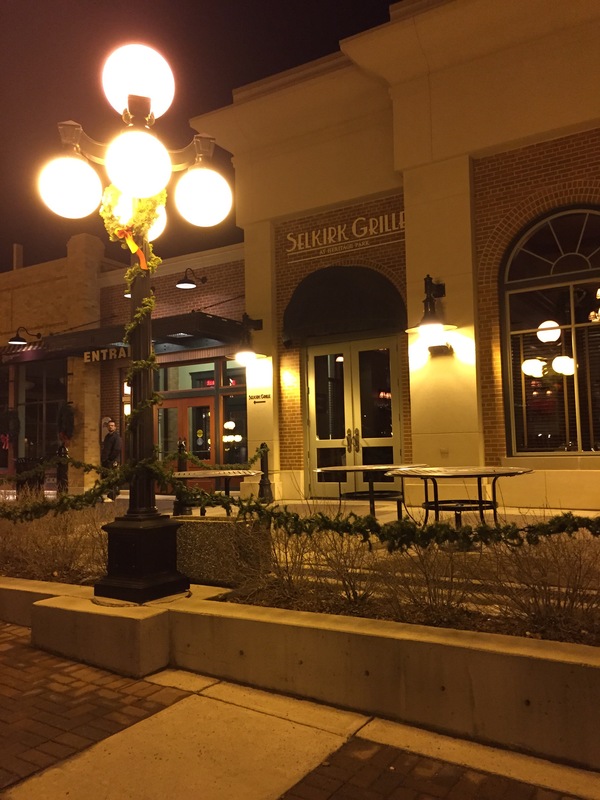 This restaurant is located in Heritage Park before the gates in Heritage Town Square. We arrived after most of the little shops had closed but it looked really cute with ye’ olde style lights along the path and vintage little shop windows. I’ll have to make a point to go back and check this out sometime. Anyways we made our way into the restaurant and were seated. The restaurant vibe is kind of classy modern vintage, with wooden beams and local art on the walls. The menu though not extensive has something for everyone. 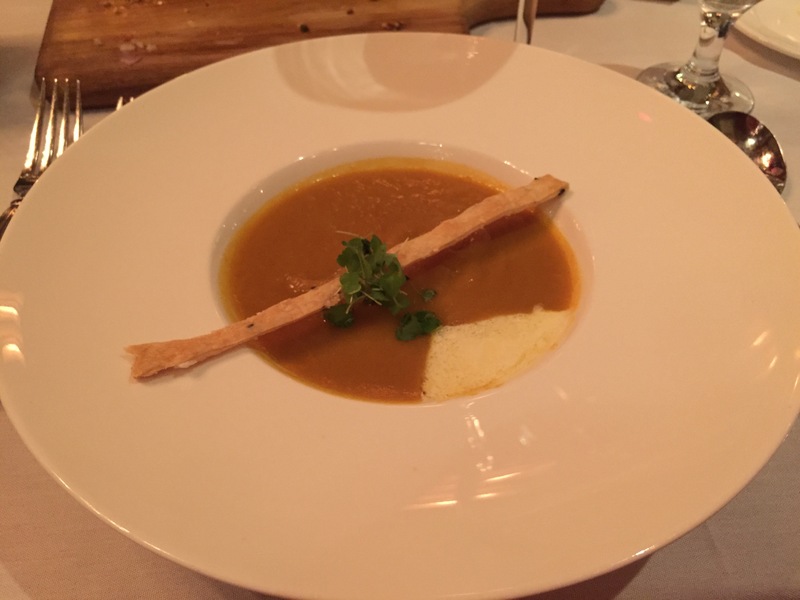 I ordered the Spiced Winter Squash Potage soup as a starter ($8). I was really good, well seasoned and nice and thick. 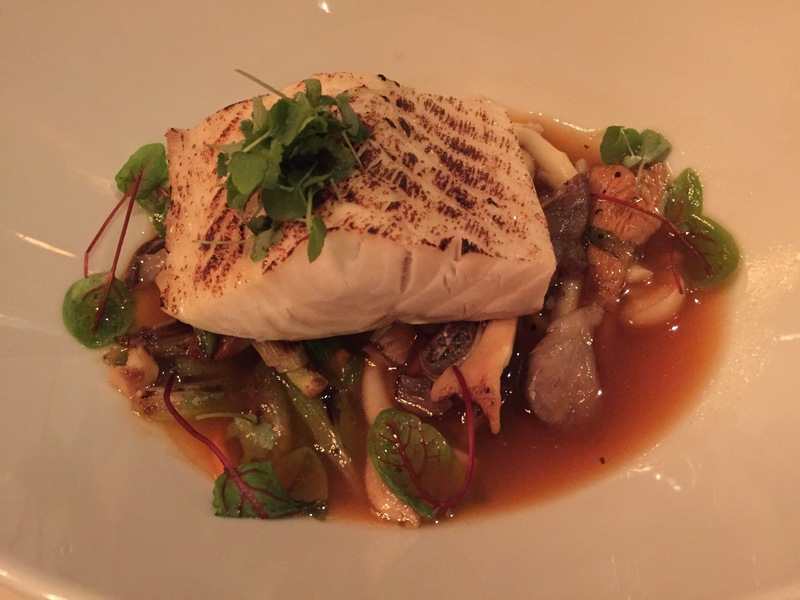 My main was the Northern Divine Canadian Sturgeon which consisted of maple dashi broth, kimchee cabbage, wild mushrooms and scallions for $32. It was quite spicy. 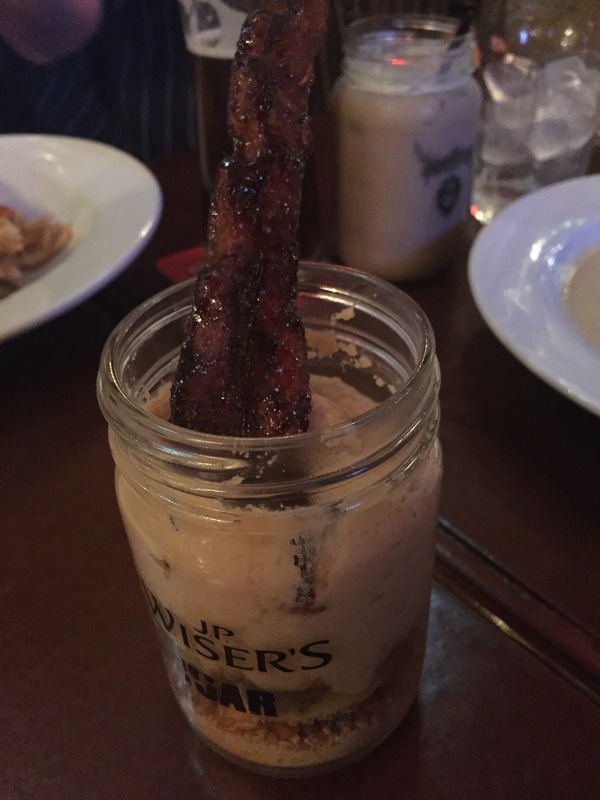 The dish was a little light. I was glad that I had the soup to start. Not the best thing that was ordered that night but that was a matter of personal taste and not that the dish wasn’t tasty. 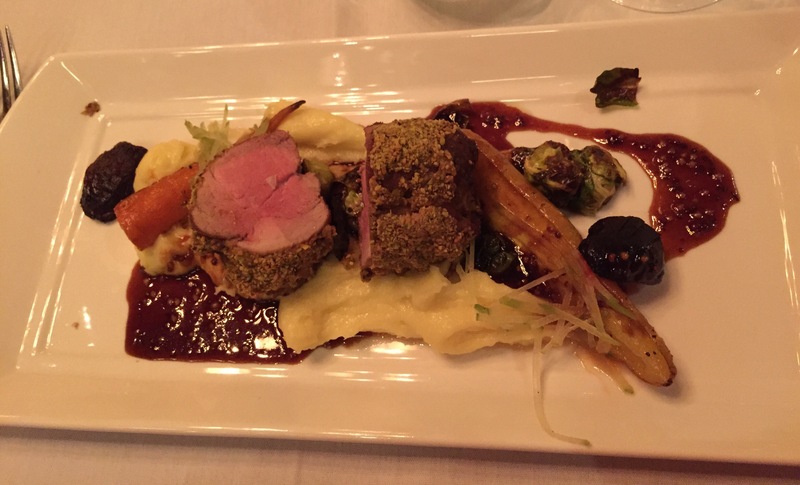 Ward ordered the Pistachio Crusted Spraggs Farm Pork Tenderloin with bacon fat whipped potato, roasted root vegetables, and a mustard jus for $29. I had a taste of the pork and it was very moist. Ward said that the dish was very tasty and was a fair portion. All in all it was a good meal with even better company. It would be neat to go and check the park out in the summer and see how the menu changes with the season. Happy New Year food friends! This post is going up a few days late because I was struggling with what kind of post to start the new year off with. I wanted to bring you guys a new healthy recipe, but I haven’t really been making anything fancy, I’ve just been eating a lot of fruits and veggies since the new year. So, I figured I’d let you know where I’ve been getting these fruits and veggies from. 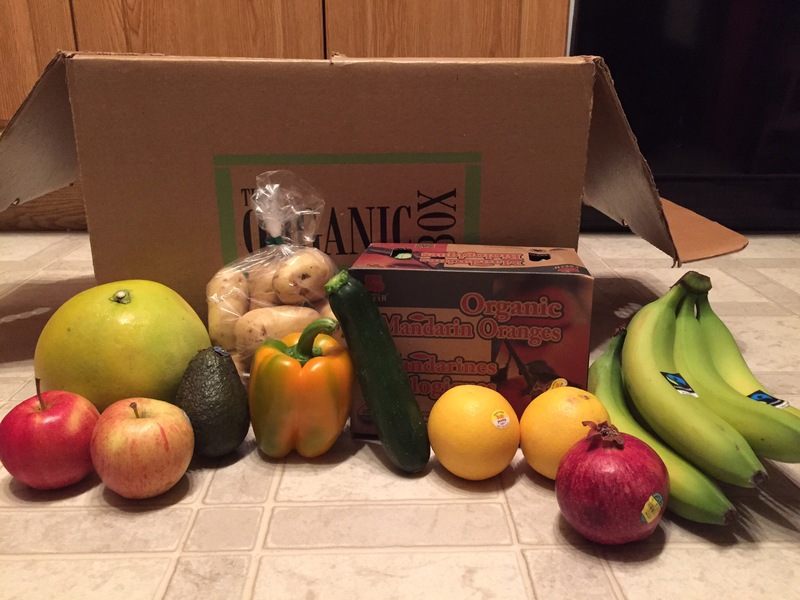 About a month before Christmas I signed up for The Organic Box. They are a local family owned company that delivers ‘local’ organic produce to your door either once a week or once every 2 weeks. They have service in Edmonton, as well as a bunch of the surrounding areas. Such as, St. Albert, Sherwood Park, Fort Saskatchewan, Devon and Spruce Grove just to name a few. They focus on local first, trying to keep as much of your dollar in our communities as possible. It’s this philosophy that ensures we can get a good variety of different fruits and veggies through the long winter months in Edmonton. 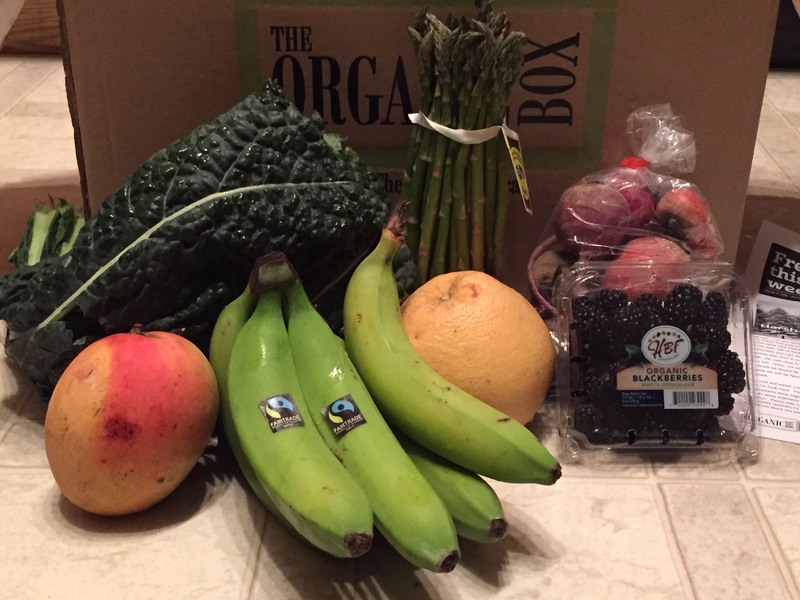 Just this week I got a mango, blackberries and asparagus in my box (among some other great items). There are 2 sizes of box to choose from; single/couple size or family size. Ward and I get the singles size (which is $38/week +tax) and it is more than enough for us for the week. Each Friday I get an email from them letting me know I can fill my box. I just go to their website and pick from the list of available fruits and veggies. Typically they have already made some selections based on what is fresh and available, but if you don’t like or won’t use the items they have recommended you can simply remove those from your box selection hit submit and custom select what you want. I have found that depending on what I already have in my box the selection of what I can still add will change. This is likely due in part to the price of each item. Because of this the actual amount of fruit and veggies you end up getting will vary depending on what the value is of the items you choose. They are also very committed to the quality of the produce that they supply. So, if you ever have an issue with something if you let them know they will make it right. 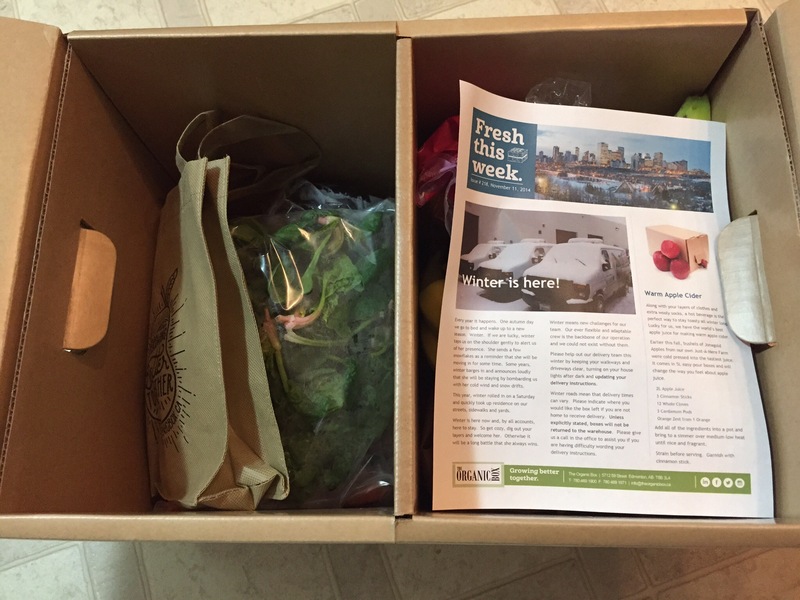 My weekly Organic Box arrives on the same day every week and roughly around the same time. They ask for you to provide detailed delivery instruction for if you are not home. So if I’m not home I just let them into my building and they leave the box outside of my apartment suite door. I’ve included some photos below of a couple of the different boxes that I have received over the last few weeks. I also think it is very important to make a stand, by ‘voting’ with the dollars we spend. 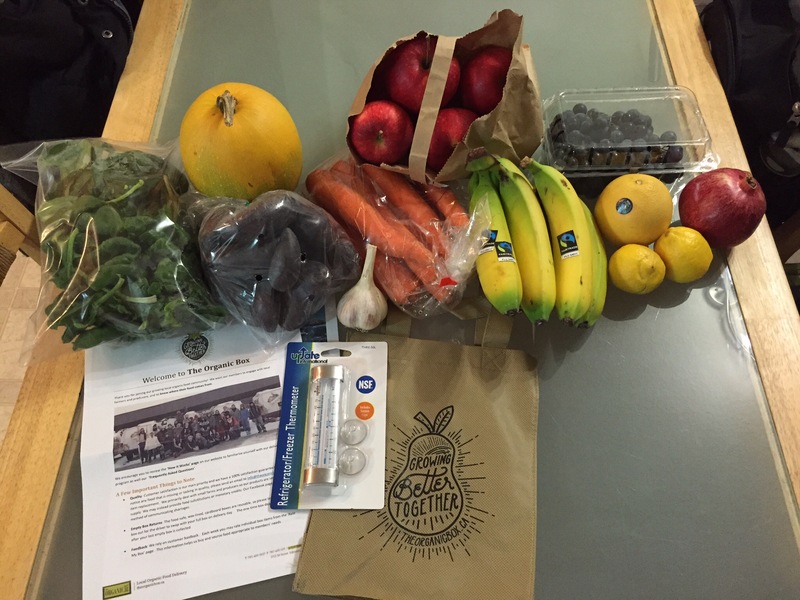 By buying organic produce, we can push out producers that use harmful pesticides that are killing bees. Not to mention all of the other problems chemical pesticides have. 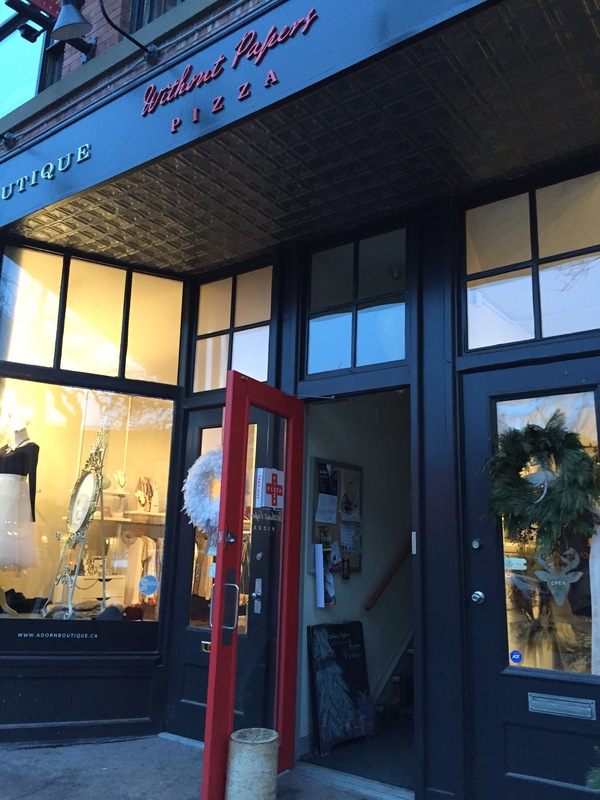 One of my personal goals of 2015 is to try and shop more local. 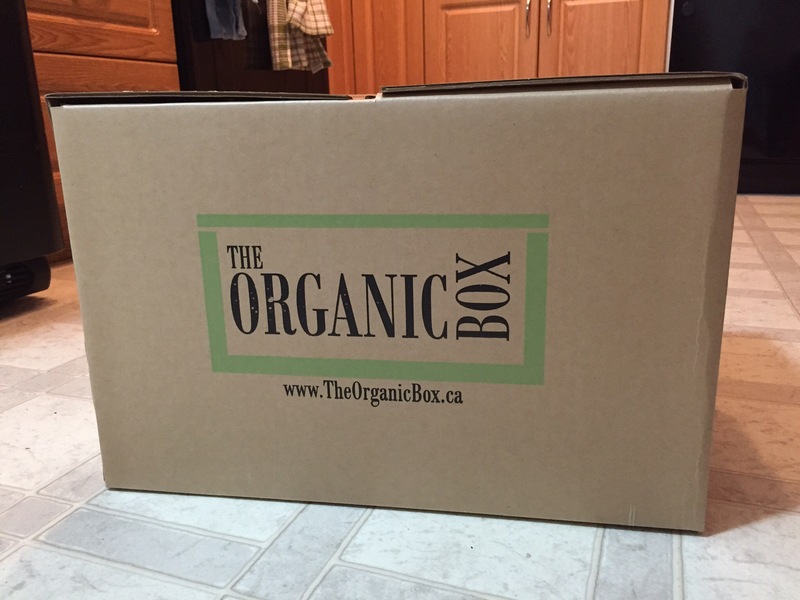 I agree with the values that The Organic Box has so I think they will be a service that I continue to use. I wish you all luck with achieving your goals for the new year. Together we can make them happen.